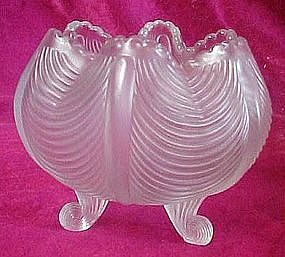 Here for your consideration is a crystal velvet three toed Rose Bowl in the curtain pattern. Made by the Fenton Art Glass Company, it measures approx. 4" H. and is 5" in diameter. The bowl is in excellent condition with no chips, cracks or nicks. Fenton Logo on the bottom.